I’d heard some positive things about this city, and I was excited to finally get to visit. After a two and a half hour bus from Cordoba, we reached the base of the Sierra Nevada mountain range and entered Granada. We’d booked a fairly plain hotel on the Gran Via de Colon for a couple of nights, right in the middle of town, and after dropping our gear headed out into the heat of the early afternoon for a look around. 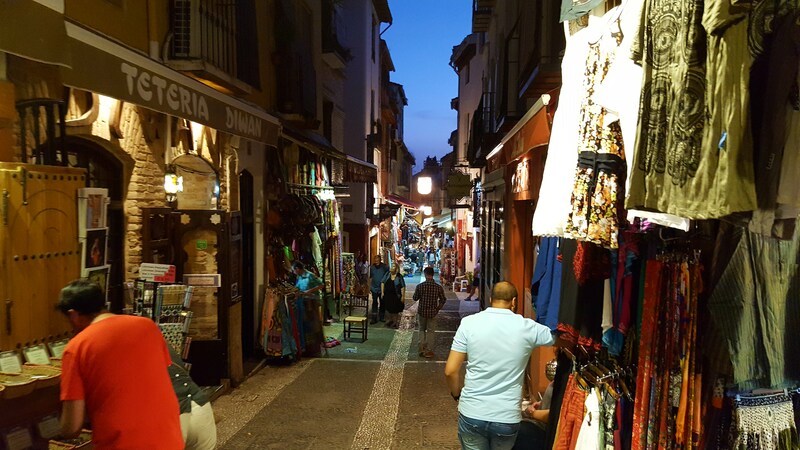 Just about immediately we walked through the south corner of the Albaicin, the historical Arab quarter of the city. Like many parts of southern Spain, Granada has a strong Muslim heritage (the name of the region, Andalusia, apparently comes from the Arabic word ‘Al-Andalus’, so that’s not too surprising), but I was pleasantly surprised to see just how present that influence still is. With all the colourful fabrics & spices, bright lanterns and the smell of shisha smoke everywhere, on many of the tight little streets I was reminded strongly of Istanbul at times. Dinner that evening, and actually every post-breakfast meal in Granada was easy to come by, thanks to one of my favourite concepts: tapas gratis. 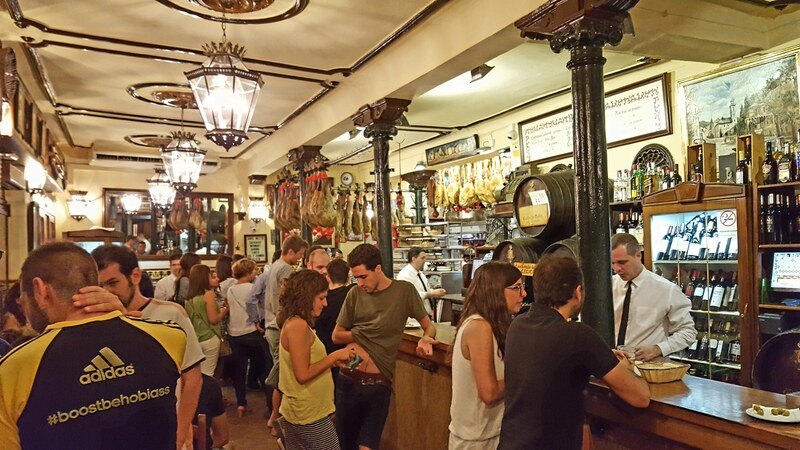 Granda is actually one of the few remaining big cities in Spain where this is still a thing – with every drink you buy, you also get a small plate of tapas on the house. Amazing! And with a small glass of beer only costing about a euro, it’s a pretty cheap way to eat your way around the city. Our favourite we wandered across on the first night was Bodegas Castaneda, and we loved the place. Cosy and local-feeling, it was standing room only when we arrived, so we found a wine barrel to hover over against a wall and started on the tapas. We must have had at least 5 or 6 rounds (keeping track of numbers got harder, after a while), and in that time the excellent, generously portioned food which came with the beer didn’t repeat once. A platter of grilled garlic prawns, local jamon and mature cheese, patatas bravas, ceviche salad on crusty bread … I’m getting hungry just thinking about it again. 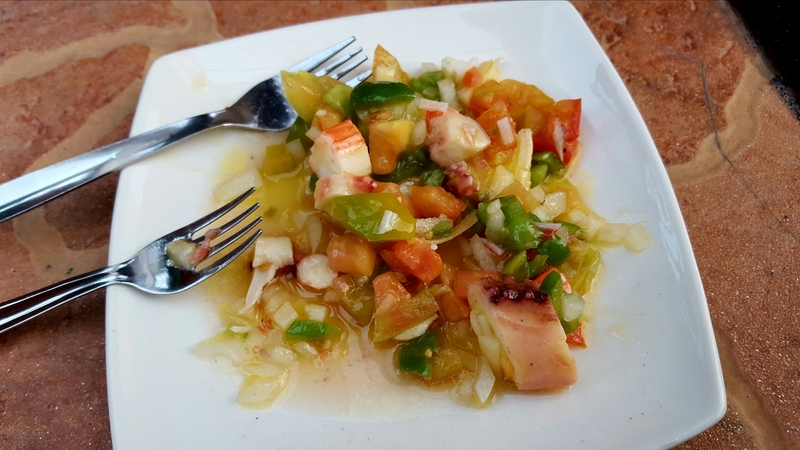 Having a Google later on, it turned out that it featured on a top 10 tapas bars in Granada list, and having been myself I can confirm it is thoroughly worth a visit while you’re there. One of the best tips I can give you for a trip to Granada is this: buy tickets to the Alhambra in advance, if you want to see it. I think you can lock them in up to three or four months ahead of time, and I’d definitely recommend doing just that. 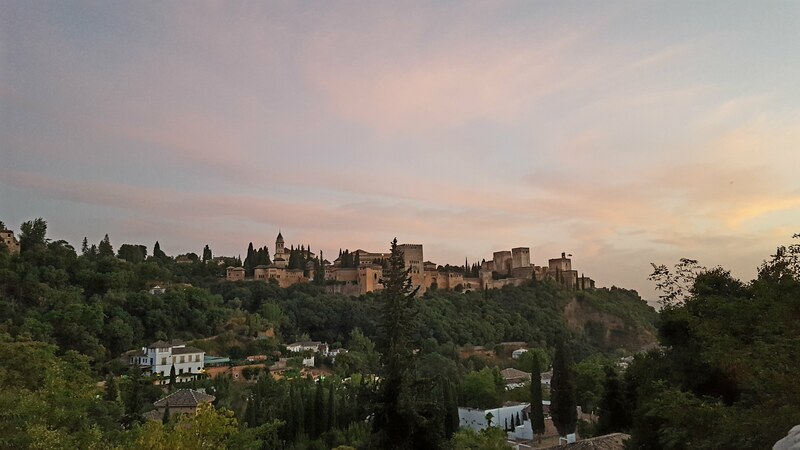 The Alhambra is a beautiful palace & hilltop fort, a world heritage site and one of the most visited sites in Spain, but I can’t tell you much more than that because we didn’t book in advance, and all the tickets for when we were there were sold out. You can get up at 4:30am and line up for some of the limited number they sell in person each day, but even getting up that early is no guarantee of success so we gave it a miss. All the more reason for another trip to Granada, which is no bad thing. Instead, the next day, we woke late, had breakfast, strolled a little and then returned to the hotel for a siesta before getting into much else. 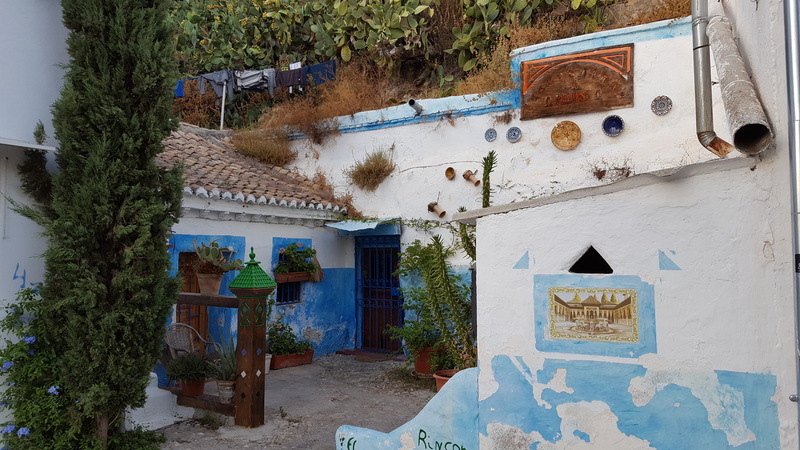 In the late afternoon we decided to have a walk up to Sacromonte to see the gypsy caves, another of the main sights of Granada. They’re more underground houses than ‘caves’, as I would call a cave anyway, but it’s a pretty interesting little district. The traditional neighbourhood appears to be giving way to heavy tourism, at least in some of the bits we walked through – busloads of tourists from Asia kept arriving to be funnelled in and out the larger, very commercial flamenco shows, but off the main streets everything still felt very authentic. The tapas gratis was also still excellent, I can report. The other main highlight of Sacromente is that you can find some amazing views back across towards the Alhambra, on the neighbouring hill. We inadvertently timed our walk so that we were up the top in the late evening, and it was superb. The pictures just don’t do it justice, unfortunately. Back down in town, we spent much of the evening watching Olympic basketball with some new Spanish friends. We couldn’t really understand one another, but so long as we clapped whenever Spain made a basket we all got on very well. The application of a few more rounds of tapas, and of course the accompanying beers, helped smooth over the language barrier. On the way home we wandered past some pretty good street performers, something I love finding while walking around a foreign place. 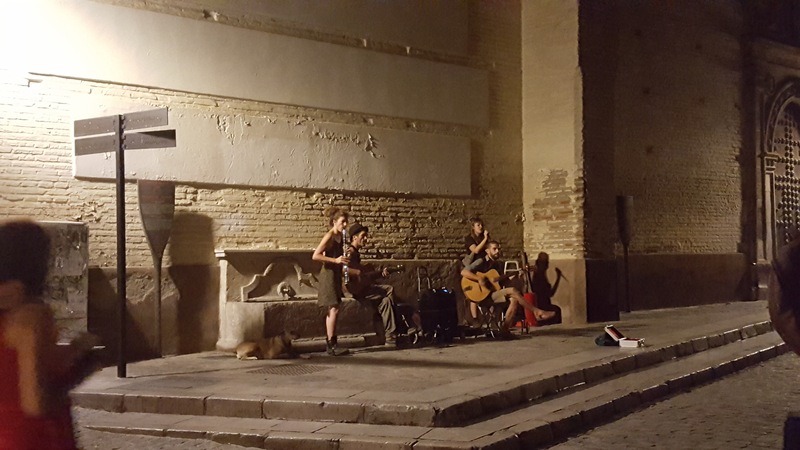 It was on a nice quiet pedestrian street, and so we stopped off and joined in the locals in buying a sangria from a local bar across the road, taking a perch on a little stone wall and watching them play for a little while. And that was about it for our visit to Granada. Two nights and one full day definitely wasn’t enough to see anything like as much of this wonderful city as I would have liked, and I’m definitely going to go back soon. Beautiful, atmospheric photos. 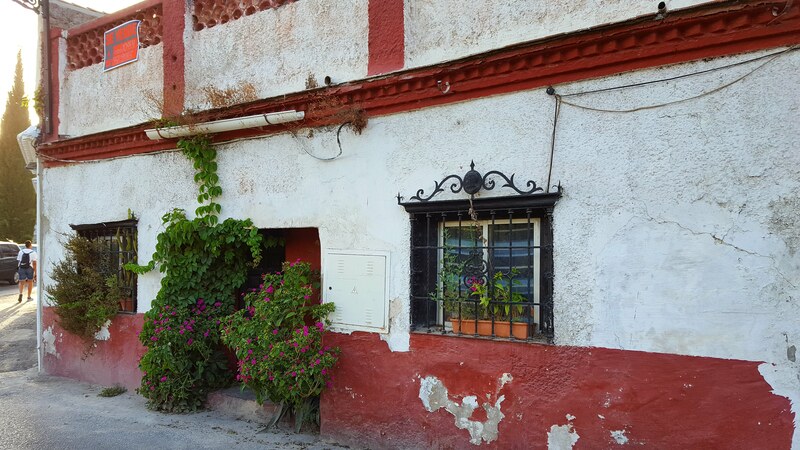 Granada lives in my dreams – it is just too intriguing to be visited just once. I cannot wait to get back there one day. And I just had a day. The woman who I did a walking tour with told me that I had to make a second trip to get to know Granada better. I could see what she meant.